As it is well known, power consumption due to compressed air is the main disadvantage of Air jet loom when compared to rapier and projectile looms. This is making air jet less preferable where energy cost is the problem, despite their high production speeds. Studies which have been taken to reduce them, included manufacturing of different parts i.e. Researches have been taken place on the manufacturing levels. But, we decided to reduce the consumption of air which may be due to some wrong settings, ignorance, etc. Without any investment which can give profits to the mill by reducing the consumption of air. A decrease of air consumption by 18% was accomplished in a weaving mill by just changing the process parameters consisting mainly the blowing time of nozzles. By improving work practices i.e. by implementing KAIZEN we could save the compressed air. For the weft insertion mechanisms of air jet looms, the profile reeds with sub-nozzle systems are the most advantageous in terms of improving high speed weaving and wider cloth width. Not only the airflow from the main nozzle and sub-nozzles but also the airflow in the weft passage is closely related to the flying state of the yarn at the time of weft insertion in this system. In order to manufacture high quality textiles with air jet looms, it is necessary to establish optimum weaving conditions. These conditions include the supply air pressure and air injection timing for the main nozzle and sub-nozzles according to the kind of well yarn. Energy saving is the most important of the technical subjects related to air jet looms today. Research about the improvement in performance of main nozzles and sub-nozzles, which plays an important role for weft insertion, has been performed by various researchers. Although some effort has been made to improve the efficiency of compressed air usage, the effort has not been uniform. There is still a critical need to understand the energy loss or consumption in filtration, distribution and machine usage in the textile industry. Due to technical barriers, reducing energy consumption by compressed air systems has been viewed as a complicated task. Intensive efforts have been made by researchers and air –jet loom makers to overcome this problem and achieve a dramatic reduction in air consumption without any decrease in loom performance and fabric quality, but due to faulty mill practices and ignored settings, air consumed by looms is on higher side. So, our project aims to reduce the air consumption significantly, by optimizing some loom parameters. These parameters, includes mainly the relay nozzles because they consume 80% of the compressed air produced. A term designated to quantify the velocity of yarn in air as well as the deviation in velocity when tested on a diagnostic testing machine known as the Air Index Tester. The amount of time required for the pick to travel the width of the fabric being manufactured during weaving, expressed either in terms of degrees of shed rotation or units of time. A numerical designation of yarn size indicating the relationship of length to weight, defined as the amount of 840 -yard skeins required to weigh one pound. A temporary shutdown of a weaving machine due to an error in filling yarn insertion. The length of yarn required to be woven into a particular width of fabric. A cotton-based yarn consisting of staple fibres usually bound together by twist. A quantitative method of describing the surface roughness of cotton based spun yarn by counting the amount of broken fibres that protrude from the surface of the yarn, giving it a fuzzy appearance. A large spool of yarn. The air jet loom feeds the filling as in Figure 1. The filling length is measured according to the width of the fabric by 1 rotation of the loom. It is accelerated by the main nozzle at a specific timing, and is inserted into the air guide o the reed. Groups of sub-nozzles are located across the whole width. Each group jets compressed air in a specific order to feed the filling tip to the right end of the fabric. The compressed air is supplied from the compressor, its pressure is adjusted by the regulators for the main nozzle and the sub-nozzles, and it is stored in the proper tank. The control system of the loom opens and closes the electro-magnetic valve, and sends the compressed air to the nozzles. Comparative power consumption figures for different types of shuttle less looms and the shuttle loom (for 190 cm width looms) are worked out (i.e. estimated) and are given in Table below. 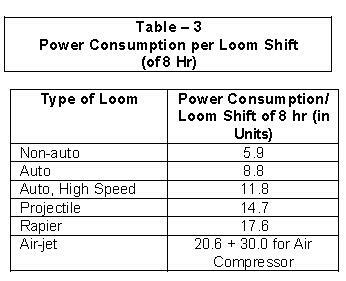 Figures in Table are only for loom drive and do not include power requirement for humidification, lighting, etc. Secondly by improving the efficiency of compressors. Ways and means for both these aspects are discussed. Leakages usually occur in small openings; but the cumulative effect is great. Some tips for preventing the air leakage are given herewith. Standardise on good hose clamps. Inspect steam packing of valves in the system periodically, repack when necessary. Install condensate separators with automatic traps to eliminate the need for operators, opening the manual valve to clear water, thereby wasting air. Use good quality air hoses to avoid breaks and leaks. Obstruction at the inlet valve. Increase in impeller-diffuser clearance in case of centrifugal compressors. It is therefore, necessary to check the volumetric efficiency periodically and if it falls below stipulated value the compressor should be checked and attended. Cost reduction opportunities that were explored include re-use of plant air, compressor motor selection, optimizing compressor control schemes, recovering the heat of compression, ensuring that the distribution lines are properly configured and free of leaks, and determining the minimum pressure and flow requirements at the end use. Typically, the air being compressed is taken from outside the plant, from air at ambient temperature and relative humidity. This creates wide varieties of conditions that the compressor has to be adjusted to meet. During the summer months, the compressor is under the greatest load. The volumetric flow rate of the inlet must be higher (around 10%) to provide the same SCFM (standard cubic feet per minute) during the summer months as in the winter. After air is used at its point of operation, it is added to the air already in the plant. This additional volume of air must leave the plant somehow, i.e. open doors, cracks in door and window frames, etc. This air that is being leaked from the plant would have much lower moisture content than the outside air. The air inside the plant will also have a higher density in the summer months due to a lower temperature. The implementation of a system that recovers the conditioned plant air may prove to be useful in reducing air compression costs. The potential energy savings from reusing this already dry air could be significant when the conditions outside the plant are extremely hot and humid. Certain geographic locations would benefit more than others from this reuse which has extremely hot and humid summer months. The installation cost of such a system can be very high for an existing plant, but this option should be considered when a new plant is designed. Improvements in motor design have led to increased energy efficiency in motor operation. New motors that are suitable for textile manufacturing plants operate at an efficiency of 95%, comparing to motors designed 15 years ago at 90% or less. Over time, the efficiency of the motors may be reduced. It is not uncommon for the efficiency to drop several percentage points after 10 years of operation. High efficiency new motors should be considered when a replacement or major maintenance is needed on the motors. Centrifugal compressors typically use inlet guide vanes to control the airflow through the compressor. This throttling is beneficial in that the efficiency is not reduced significantly with this method of control. The typical throttle range is down to around 80% of maximum airflow capacity. The highest efficiency is reached when the compressor is operating at 100% capacity. If air is not being used on the demand side as fast as it is being produced, the pressure will rise in the air receiver. A compressor (or multiple compressors) must be throttled to prevent this. All of the compressors should be operating at full capacity except for the one(s) being throttled. If the total compressor output is still greater than the demand after the compressor(s) has been throttled to their limit, air must be exhausted from the system through the blow -off valve. An appropriate control scheme can reduce or eliminate this wasteful blow-off. A precise compressor control scheme with little pressure variation is desired. The compressor does not need to produce air at a higher pressure than the minimum pressure required for proper plant operation. The typical pressure output by a compressor tends to fluctuate somewhat throughout the day. A good control scheme would minimize these fluctuations. The distribution system represents a great source for energy savings. There are pressure drops associated with the flow through all equipment in the line, even in the piping itself. The pressure drop from the point of use and from the output of the compressor should be as low as possible. Equipment should be properly sized to give a minimum pressure drop. End use equipment should be evaluated so that it is using the lowest possible pressure and flow. The ultrasonic detector is able to focus the sensor at a specific point, making it suitable for detecting leaks while machinery is in operation. Escaping air produces the highest noise levels at a frequency around 40 kHz, well beyond the human audible frequency range. The device measures the loudness level at this frequency. Estimates of the amount of air can be obtained from the dB reading. Several physical properties and characteristics of yarn are thought to have an effect on yarn velocity in air jet weaving applications. The yarn characteristic thought to have the most effect on yarn velocity (and therefore, Air Index value) is the yarn hairiness, which is a quantitative means of describing the surface roughness of a cotton-based spun yarn. Yarn hairiness is a means of counting the broken fibres that protrude from the surface of a spun yarn, giving the yarn a fuzzy appearance. It is hypothesized that yarns with higher hairiness values will result in higher Air Index values, due to an increase in surface area of the yarn for the air to “push” on; i.e., an increased aerodynamic drag. Other physical characteristics of yarn will be investigated in this report to determine whether or not they have an influence on Air Index value, especially yarn count. The count of a spun yarn is a numerical designation of yarn size that relates the length of the yarn to its weight, as well as describing its diameter. The higher the yarn count, the smaller the diameter and density of the yarn is, so it is thought that higher yarn counts will result in higher Air index values. This is due to the increased surface area-to-mass ratio as yarn count is increased. Correction made delayed opening loss pressure through valve enhance the efficiency of machine. Early opening will reduce the air consumption. Improper opening & closing timing of valves lead to undue stress on yarn thereby leading to break. After proper adjustment the no. of end breaks can be reduced. The air consumption can be reduced up to 5 to 6%. Pressure on nozzle has more impact on the m/c performance. 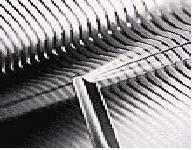 Improper pressure adjustment will causes the weft stop during working so quality & productivity can be minimized. To avoid the problem, proper setting of pressure can be required. These can be adjusted according to count, rpm, width of m/c. 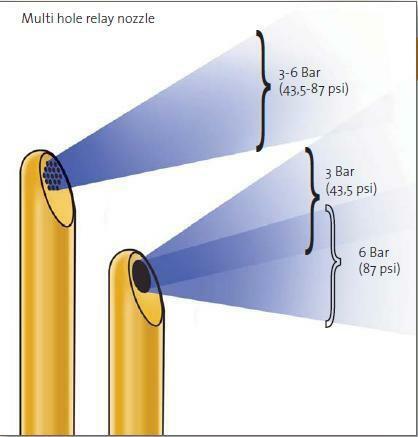 Proper combination between main & relay nozzle will reduce the air consumption. Distance between two nozzles: Improper setting between to relay nozzle will cause to variation in air pressure and will cause m/c performance to be in decreasing the air consumption will be unnecessary increases. Nozzle height: Proper height setting of relay nozzle will causes reduction in air pressure during weft insertion & air consumption can be reduced. Proper setting of the nozzle height will provide the uniform displacement of yarn during insertion. Nozzle angle: For uniform weft insertion of yarn during insertion proper nozzle angle will reduce air consumption. Pressure required for insertion can be reduced. The multi hole relay nozzles guarantee a very stable blowing angle at different pressure levels. This is recommended for style changes that require different relay nozzle pressure settings. The single-hole nozzles need to be adjusted by hand whereas multi-hole nozzles keep their blowing angle stable and do not need any adjustment or fine tuning. Due to the pre-given horizontal and vertical jetting angles, the multi-hole nozzle requires less space between the warp yarns, which prevents nozzle marks in your fabric. The multi hole pattern allows also a more efficient air stream, thus delivering a better performance over single hole nozzles, giving up to 15% higher yarn speed for the same air consumption. Single-hole nozzles are recommended in case of a dusty environment or low air quality. The D-type nozzle is available with different hole patterns (1 – 7 – 16 – 19 holes) to suit your specific need. The highest performance is given by the 16 hole nozzle, offering you specific benefits. 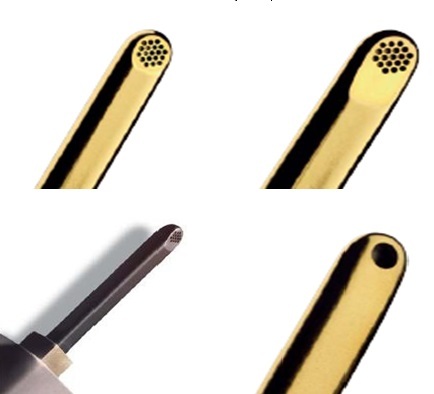 Types of Relay Nozzles 1.C Type 2.S Type 3.D type 4.B type. With the revolutionary 16-hole pattern, the air stream is now perfectly parallel to the warp yarns, thus making maximum use of the insertion time. As a result, higher weaving speed for increased productivity or a gentler yarn passage for better fabric quality is guaranteed. The D-type 16 hole nozzle can offer you significant cost savings. This nozzle can generate the same yarn speed with less air consumption in some cases up to 15 – 20 % depending on the weaving condition. Either, with the same air consumption, you are able to increase the yarn speed. The D-type nozzles are exclusively coated with Diamond -Like carbon coating which is superior to any other coating. It increases life time up to 5 times and avoids wear and yarn cuts. DLC coating is therefore specially recommended for abrasive warp yarns. Control of sub-nozzles by increased groups conventionally, as in Fig. sub-nozzles are arranged in groups of 4 nozzles. An electro-magnetic valve is attached to each group and the sub-nozzles of the same group jet simultaneously. Tsudakoma’s new arrangement, as in Figure, has an electro-magnetic valve with a smaller inner volume so that it matches to 2 sub-nozzles. The control of valve is improved, and extra jetting time is reduced. Saving the compressed air required for the air jet weaving which is a major cost element in the fabric costing. And by saving this compressed air we can make the profits of our company by saving power units required. Because of this, fabric conversion cost is also reduced. = Rs. 2574720/year/50 loom shed. Thus a huge amount of capital can be saved just by proper setting of various machine parts without having any additional cost incurred. This shows that the weaving mills could obtain considerable saving in energy cost by just improving the work practices and by avoiding ignorance in settings. Reduction of air consumption by about Rs. 2574720/year/50 loom shed by achieving shortest possible blowing time of various nozzles, and optimizing this setting by trial and error method without affecting the performance of loom and quality of fabric can be achieved. Hence considerable saving in Energy cost can be achieved and Miracles can be created thus Investors can be boosted to move to Airjet technology resulting into new scale of measure of woven fabric production. Adanur, S., and Mohamed, M. H., Analysis of Air Flow in Air-Jet Filling Insertion, Text. Res. J., 61(5), 253-258 (1991). Adanur, S., and Bakhtiyarov, S., Analysis of Air Flow in Single Nozzle Air-Jet Filling Insertion: Corrugated Channel Model, Text. Res. J., 66(6), 401-406 (1996). Adanur, S., and Turel, T., Effects of Air and Yarn Characteristics in Air-Jet Filling Insertion Part II: Yarn Velocity Measurements with a Profiled Reed, Text. Res. J., 74(8), 657-661 (2004). Mohamed, M. H., and Salama, M., Mechanics of a Single Nozzle Air-Jet Filling Insertion System Part I: Nozzle Design and Performance, Text. Res. J., 56(11), 683-690 (1986). Ishida, T, “Air-Jet Loom, Present and Future, Part 5: Technical Problems Caused by Air-Jet”, JTN, November, 1982. Tarabadkar, S. A., Sharma, H. M., and Yadav, D. H., “Assessment of Compressed Air Requirement for Spinning and Weaving Machines”, Vol. XXXI, No. 3, The Bombay Textile Research Association, September, 2001.